Swami Ayyappan in Sabarimala temple is a celibate God and said to be the incarnation of Sree Dharma Sastha. The idol of the deity seen at the Sanctum Sanctorum of the temple is in an Ardhasana or Yogarudra Siddasana posture. This mode of sitting is said to be the feature of celibate gods who have been in austerity or asceticism. In his throne, his knees are found conjugated at back side with a cloth belt called Yogapatta and signifies the spirit of observance and meditation. In other words this posture can be referred as a state of consciousness with blissful awareness. As far as a self realized person is concerned, all his thoughts would be under control. Devotees have to recognize the divinity of the inscriptions “ThatTvam Asi” seen in front of the Sabarimala temple, which means “You are that supreme Consciousness”. 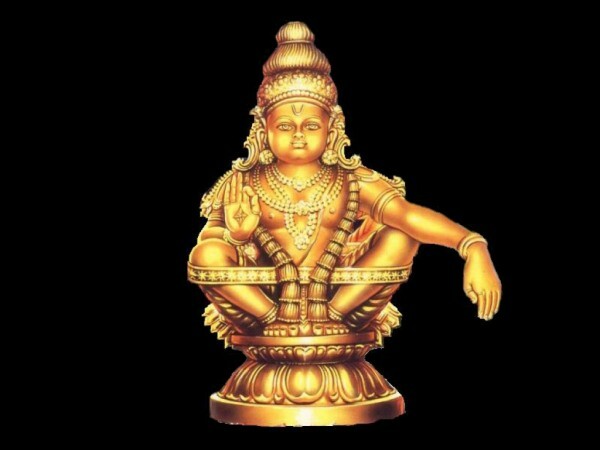 This is also represented by the ‘chin-mudra’ shown by the Ayyappa Swami in association with his his Ardhasana posture seen in the idol. As per the chin-mudra concept, little finger represents body, ring finger represents mind (that is why the wedding ring is worn in mind finger because the event is the joining of two individuals with respect to their mind level). The middle finger stands for senses while the fore finger represents the feeling “I” or ego thought. The thumb is said to be the consciousness finger or intellect finger without which the other fingers are absolutely useless. The forefinger is always seen in association with the other three fingers and when it is brought in contact with the thumb to form a circle the same points out that the consciousness has no beginning and end. Through the chin mudra, Swami Ayyappan advises his devotees to achieve the concept of the same in their life too. Like all other deities, Swami Ayyappa also has an animal vehicle. Regarding this, there are some misunderstandings. As per the available information the animal vehicles of Ayyappa Swami are horse, elephant, lion, tiger etc. In the Sanctum Sanctorum of the Sabarimala temple horse can be seen on the flag tower of the temple. As per the Harivarasanam text, elephant is the vehicle of Sree Darma Sastha. It is said that both black and white elephants are considered as the mount of the Lord. The horse of Sastha is said to be green in color. In the incarnation as Ayyappa, Lord Sastha is seen mounted on a tiger. In the epics, tiger is not mentioned as the mount of Sree Dharma Sastha. But in a saga called Sree Maha Sasthru, it is said that there are five animal carriers for the Lord. They are elephant, horse, tiger, leopard and lion. In one occasion Lord Sastha can be seen sitting on and controlling an angry elephant. There are two meanings in the consecration of these animal carriers with the idols of the respective Gods. All these wild animals have no control on themselves. Gods are seen mounted on these animals after being controlled them properly. All these beast animals are the representation of human qualities called Kama (Desire or possession), Krodha(anger when desires do not get fulfilled or when desired possession is lost). Lobha (greed to fulfill the desire or not allowing anyone partake in one’s possession), Moha (Infatuation of the obtained result or having the possession). Mada (pride of getting the desire fulfilled or having a possession) and Matsarya (Jealousy that others should not get what we have fulfilled our desire or when others have a possession that we have). By mounting on these wild animals they point out that they have succeeded in controlling these animals. Likewise, they advice their devotees to control the aforesaid negative qualities and mount on them. This will enable them to succeed in their life journey. The images of gods and goddesses with these beast animals make people remember that they are also the inhabitants of nature and insist the need to love and respect them. If this can be practiced by the human beings, the world can be transformed as a paradise. Vehicles are generally used to reach a destination quickly. Likewise, devotees are advised to control various evil natures in mind which stand against fulfilling good desires and take an initiative to succeed in life ideally.